I put a lot of thought and time into my vacation planning as we travel a lot, but not everywhere we travel has been a blast. We have five and sometimes up to 8 people in our travel group(kids to adults) and we all like different things to make our vacations great. I have to make certain that everyone will have their ‘wants’ matched up. I become a bit fanatical about the planning it is only because I want everyone to have something to do so that everyone has a great vacation but classic trips to the beach generally are not a one-size fits all prophecy. When we decided to take this adventure, it was to celebrate a graduation, and to just get out and explore with an adventure that would be multi-generational. This particular vacation we decided to embark upon a trip that was perfect for everyone in my family from ages 10-100. A cruise lets the possibilities of what we would do each day open and endless. Before the fun starts, it’s time to learn about Cruising Carnival Safety, Security, Luggage & Check-In so that you can start your adventure with Carnival and smooth sailing navigation through the on-boarding process. Let’s lavishly live life out loud and visit the Carnival Sunshine and sail from Port Canaveral, Florida to the Western Caribbean. 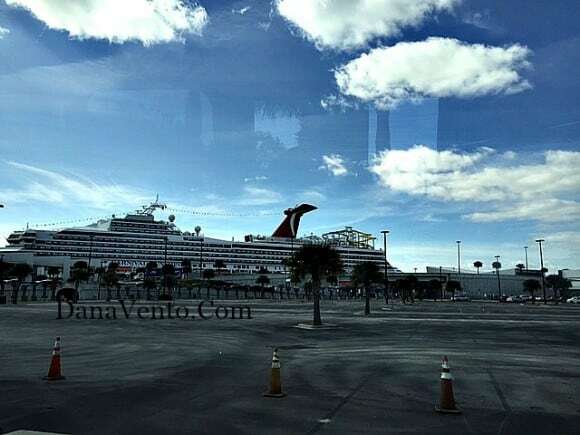 Once we arrived at Port Canaveral in Florida, the actual reality of the vacation set in as my first glimpses of a cruise line I had sailed with a few times before actually presented itself again as the ship was docked and waiting for its passengers! The kids ‘oohed and awed’ at the size of the ship, as they had never seen a cruise ship this close and the size is just beyond mammoth. I personally just started thinking about our other cruises and the fun we had and suddenly it seemed surreal. We were really there again and ready to travel and have one of the best weeks we have had in a long time. The ship was at dock and we were just feet away from entering. 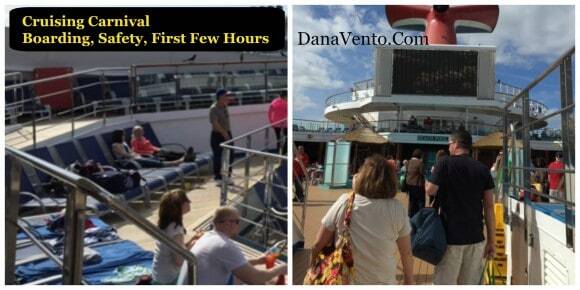 Let me share the simply process of Cruising Carnival Safety, Security Luggage & Check-in. You might be wondering what is involved when boarding the Carnival Ships and I can tell you it is pretty much just like going to a floating hotel for a week, with better service, pristine cleanliness and a groups of people, and families that want nothing more than to just have fun. Some of the nicest people you will ever meet will join you and your family on a cruise ship and you will probably make some new friends. Once you are dropped off at the port, your cruise is about to begin, and the process can go as smooth as ice if you are prepared. If you have flown to the destination you have already been through the TSA check, which will help you move even more quickly through this process, providing you have not opened your luggage and added any goods in it. We have cruised before and I knew that we needed to pack a carry-on to keep with us until our main luggage got to our room. When you pack, pack a carry-on that will allow you to have fun in the sun, until your luggage arrives to your room. See what to pack in my article Cruising Carnival Packing Tips Day One. Once at the port, you pass through a security check point, do no have you CAMERA out and taking photos here, it is NOT allowed. There are 2 different doors here and you go through either one side or the other. If you are a VIFP Diamond or Platinum Level you go through one door and if you are just cruising and have not received status yet you go through the other. Your bags are placed on a conveyor belt, and scanned for illegal items. All small items are placed in a bin and you collect them once you are through. You then head on over to get your room key and your photo and get ready to get on the ship. With your key in hand, and if you have VIFP status you load onto the ship, and if you do not you simply wait and they board you little by little, calling our your section for boarding. We were VIFP as we have sailed before and we went ahead and boarded. You walk up to the designated area, are greeted by Team Carnival, and your family is photo’d by one of the ship photographers (your first of many), smile big and say, “CARNIVAL” and get ready to have fun in the sun! 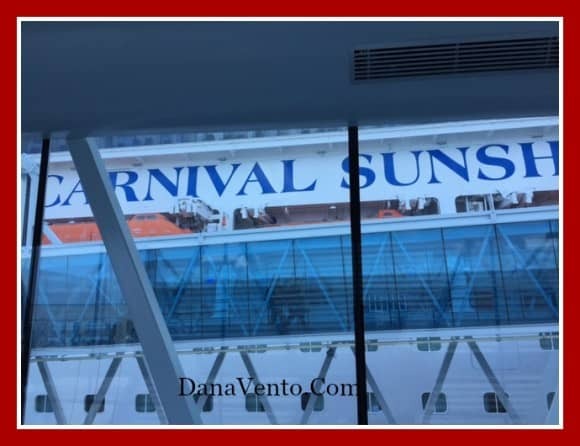 Now that you smiled, move on, through an escalator and then down a hallway, and over a ramp that connects you to the Carnival Sunshine and suddenly you have entered the LOBBY of the ship. Uhhhhhhhhhhhh, let the excitement begin as the music is pumping, the Luggage are flowing and your vacation has began. Head to the Lido Deck and start into the food, just bring your luggage you have with you and get ready for some fun in the sun! You can see all the people hanging out, eating, drinking and note their luggage(carry-on) is with them as they wait for their rooms to open! If you have read all about your cruise you know that most rooms on the ship are not ready until at least 1:30 and often your luggage will not arrive until after that point in time. Remember, on this particular ship there are over 3000 guests that travel on it and it takes a bit of time for your luggage to arrive to your Luggage . Often you can get into your room ahead of your larger luggage arriving, and if you have packed a small carry-on, hopefully you will have the right items in it to start your vacation. Read my article on Carnival Cruise Packing Tips for Your First Day to learn what to put in there. We changed and headed back out to the pool area, until the Muster Drill time. Once everyone is boarded it’s time to set sail. It’s time for the Muster Drill and you Must attend. This is the quick safety course that shows you where to go in case of an emergency at sea, it’s about where to come to, how to fasten the safety vests and what is inside of those vessels(water, food, etc). You do not bring your life jackets with you, these are in your room closet and stay there. You will watch your crew member place one on. My son is Under 12 and he wore was given this band to wear for the entire cruise. He did not take it off and they ask you to leave it on all the children under age 12. This will help in an emergency to identify where the kids need to go if they happen to be separated from you. You are counted by one of the crew members, and that is how they make sure everyone is there. They also discussed FIRE on a ship and how deadly it can be, as well as not tossing a lit cigarette just anywhere because it can really harm the ship with fire that spreads so quickly. Listen, learn and then you can begin your journey safely. Once you are done with the drill(it took about 25 minutes on our ship) you are then free to have a fantastic trip! I am going to make a few comments here, because it is necessary. You might be on vacation, but this will help you if there should be an emergency. The crew needs to be able to talk and you need to listen. This is not a time to be totally inebriated, or obnoxious because it is a crucial time to know what to do if……. Try to remember, your Luggage needs to be safe and if everyone is listening and follows the rules, it will all go smoothly! The other is that the spacing is tight in the muster lines. Be prepared to literally be standing on top of one another, so if you are space anxious please take note and be forewarned. People were complaining about this drill, but what would happen if something happened while we were at sea? You need to know what to do, it is short, simple and may very well save your life! We loved it because we met a lot of people quickly and we all talked until the Crew began their discussion and presentation! Once the Muster Drill on the decks is done, it’s time to have fun! Head to the Luggage , because this is where the fun is going to be, grab a drink and let the Cruising Horn sound, it’s time to set sail! No matter which side of the ship you choose to watch the ship sail off from, it is fun! Bon Voyage with Carnival! We were provided a room on the Carnival Sunshine, all opinions, and comments, and photos are my own. These are great tips security, luggage, and safety for cruising Carnival. Considering your safety or the safety of those traveling with you is a big thing to keep in mind when on a cruise in my opinion. Thanks for sharing the tips. 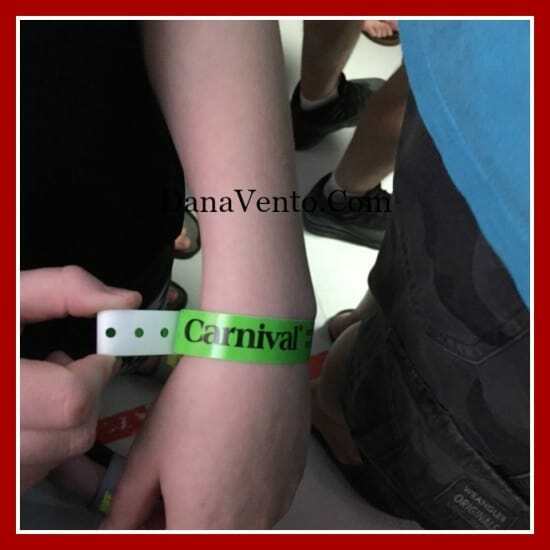 These are great tips when traveling with Carnival. I’ve been on a few myself and I enjoyed it! This is a very great article with useful safety lists. I have never been on a cruise, sounds fun! Thanks Rika, it is so important to know that the cruise ships in fact really care about safety of all of their passengers. I have never been in a cruise before but all of these tips are so helpful. We have been thinking about booking one with Carnival so now I know everything I need to. Thank you for the advice, we’ll use this once we go cruising in the future! We really dream to do it soon! These are great tips. I always worry about luggage and security when traveling. Once that is clear then I breathe easier. There are so many rules now a days I don’t want to break any. This is great advice. I hope to go on a cruise again soon so I will keep these in mind! Wow you are covering all of the bases of going on a cruise, this is very informative and I am glad you shared this. Looking forward to more posts about your cruise experience and how to! I like that they have the bracelet system just in case the kids get separated. The muster drill sounded helpful. The bracelets are great ideas and I like the degree of safety they go through to help us all be safe. I’ve still never been on a cruise but I like that it is a vacation place for all ages. My kids are 7 years a part and it can be hard to find fun that both of them can appreciate. I have never been on a cruise. It is kind of intimidating to me. I love how you showed what I could expect if we ever did go on a cruise. Do not be intimidated be ready to have a blast. cruises are a party. Being on a cruise is something I have yet to do. These are also good pointers here. Oh I am so jealous! I love going on cruises and carnival is number one for us. I may have to pack myself in your bag next time. You did a great post on the step-by-step process. I think people should all read this before they go on a cruise. I have never been on a cruise. I would love to take one, as I hear they are awesome! I’m going to have to find time to take one soon. lisa recently posted..Have a Slice Of Jet’s Pizza! These are some awesome tips that people need to take heed to when they are getting ready to go on a cruise. I plan on going on a cruise myself later on this year and I going to make sure keep these steps in mind. I have never been on a cruise, but hope to go one day soon. This is a great information guide so I know what to expect! Love how you mentioned what to pack for the first day, when we were leaving our cruise ship there were people disembarking in towels and sheets because they forgot to pull out clothes to wear off the ship and their luggage had already left!! LOL!! I so miss cruising..we had a ton of fun! I haven’t cruised in years. We normally just pick a destination and travel by plane. However, my grandkids have never been on a cruise and I want to take them soon. These tips will really come in handy. Great advice for staying safe during your cruise. The rules are there for a reason and following them is your best bet for keeping safe for the entire trip. Thanks so much for sharing.